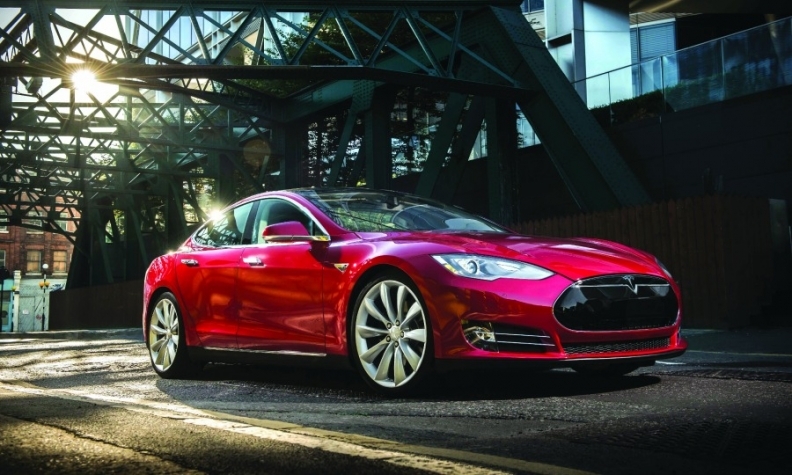 The Tesla Model S has risen to No. 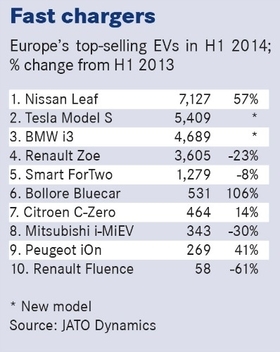 2 in European EV sales in its first full year on the market. Helped by new entries such as the BMW i3 and Tesla Model S, the market for electric cars in Europe will continue to grow as automakers extend the range of their battery-powered models and consumers begin to accept the technology. Europe EV sales may rise to 150,000 with a "high scenario" of 250,000 by 2020 in a total global market forecast to be 19.3 million, analysts LMC Automotive predicts. LMC expects EV sales to be 53,000 this year, up from 31,615 in 2013. Nissan Europe Chairman Paul Willcox said EV sales are increasing as ownership fears subside. Battery durability and worries about the robustness of electric drivetrain technology were among the early concerns that held back sales. “No one is talking about that anymore,” Willcox told reporters at the Paris auto show in October. 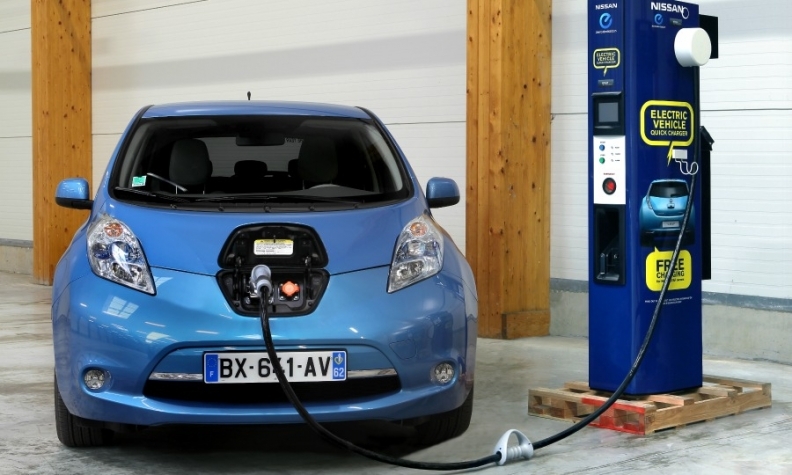 Norway offers EV buyers up to 11,500 euros in incentives if they buy an EV, according to the Brussels-based lobby group Transport & Environment (T&E). Last year, EVs accounted for 6 percent of Norway’s new-car sales, the highest in Europe. While Norway is generous, other European countries aren’t. Spain, for example, has no incentives, according to a recent report by European carmakers association ACEA. Most eastern European countries also don’t support EV purchases. Willcox said Germany, Europe’s largest car market, was “a slow responder” in pushing incentives but France and the UK are giving solid support to EVs, which is boosting sales in those countries. “The UK is probably the base case study because we’re now getting momentum in charging points and it’s coming through in sales,” he said. Automakers that sell electric cars agree that having a large number of public charging points is crucial to overcoming range anxiety. However, the EU in October backed away from a proposal to force member states to establish a minimum number of charging points by 2020. The EU is now recommending that countries install one public charge point per 10 electric vehicles on the road. Greg Archer, clean vehicles manager at T&E, said public charging points are not so important when people own an EV, although they are key to encouraging people to buy an electric car. 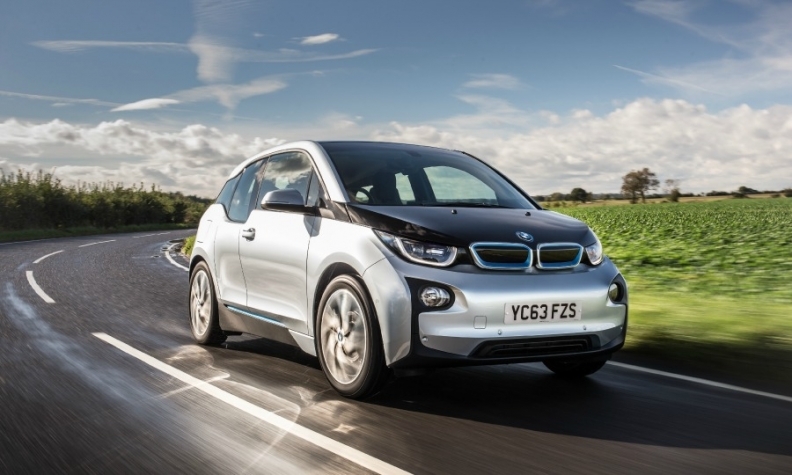 BMW beat Mercedes and Audi into the full-electric niche with its i3. “Evidence suggests that most EV owners charge at home and that use of public recharging points is quite limited. However, many prospective EV owners do need to see public recharging before they are willing to commit to a purchase,” Archer told Automotive News Europe. Europe accounts for about a quarter of worldwide EV sales so the future success of the technology will be decided globally rather than regionally, T&E says. Greater economies of scale are needed to bring down the current high price of electric cars, the group says. Renault-Nissan CEO Carlos Ghosn expects the EV markets in China and the U.S. to grow significantly. “When you look at emissions regulations in the U.S coming in the next five to six years there is no way any carmaker can make it without the substantial part of their offering being electric cars. Our engineers estimate this should be at least 15 percent to 20 percent of sales,” he said at the Paris show. The Nissan Leaf was named European Car of the Year in 2011 and has been the region's top-selling EV since 2012. Recent EV launches show that automakers are succeeding in improving the driving range of their EVs. Volkswagen says the electric version of its Golf, which went on sale in Europe this summer, can be driven 190km before it needs recharging, making the car practical for everyday driving. The e-Golf starts at 34,900 euros in Germany. At last year’s Frankfurt auto show, VW Group CEO Martin Winterkorn said the company’s brands could produce 40 pure electric or plug-in hybrids if there was sufficient demand. EV production is being integrated into existing factories such as Wolfsburg and Leipzig in Germany and in Puebla, Mexico, he said. Nissan’s Willcox welcomed the increased competition. “That has a positive benefit because we have a big education job to do,” he said. EVs will become a more common sight in Europe as taxi operators and car-sharing programs add more electric cars to their fleets. In Brussels, most taxi companies chose the E6 sedan built by China’s BYD in the city’s first tender for emission-free taxis, opting for the E6 over the Nissan Leaf compact and Renault Zoe subcompact because of its roominess and its 300km driving range. London taxi firm Thriev has 17 E6s. Other taxi companies in the UK capital use the Nissan Leaf and Tesla Model S. In France, Renault and electric car maker Bollore, are setting up a joint venture to provide car-sharing services using EVs in France and elsewhere in Europe. The network will add the Renault Zoe and two-seat Twizy models to Bollore’s battery-powered Bluecar. European EV sales nearly doubled to 24,000 in the first half from 12,480 in the same period last year, according to JATO Dynamics. The region’s top-selling EV is the Nissan Leaf subcompact with sales of 7,127 through June. The Tesla Model S sedan at No. 2 and the third-ranked BMW i3 compact hatchback combined to account for more than 10,000 of all EVs sold in Europe during the first half. The success of those two cars means that full-year EV sales are on course to easily beat 2013’s total of 31,615.